There are some greeting cards you may want to keep for sentimental reasons, but you can’t keep them all. Well, you could, but would you really want to? One option is to recycle greeting cards, but reuse is better and could be cheaper than buying cards. After all, the average American receives around 20 greeting cards each year. Reusing just half of those will save you time and could also save you money. reGreet kits are a new idea from Christy Eichers, President and Founder of reGreet™, and her team. Each kit, which sells for $11.99 online, contains recycled materials for regreeting four cards yourself and four hop along kits so that your recipients may also regreet! Single sets for repurposing one card are also available. You apply a signature label over the old handwritten message and write your own. Then affix a journey label so that the card’s travels may be tracked online. Use the supplied envelope and notepaper if you need to say something more. Include a hop along kit so your card recipient can reuse the card yet again. reGreet is a nice way to reuse greeting cards. Plus, how can you not like something with a cute frog logo? 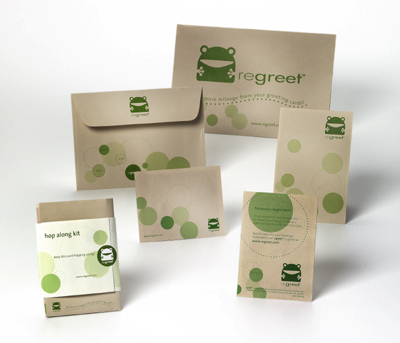 While reGreet is a recycled product that allows you to reuse greeting cards, you could hit a few snags. reGreet is designed for standard cards. If you have an oversized or oddly shaped card, reGreet envelopes and labels may not work for your card. Likewise, if you have a card with a verbose printed message (hate those), then you may need to trim the label to a smaller size. Plus, you may not always have an appropriate card on hand to regreet. For example, you may need a birthday card for a kid, but your stash doesn’t include any of those. Despite those potential snags, reGreet will most likely work for many of the cards you receive. It has great potential to save some trees! And reGreet could be a great time saver for you as well. I don’t love standing around the card aisles. Do you? reGreet also offers a greeting card organizer to help you keep track of important dates and cards you may want to send on again. It’s a cute book with handy pockets and easy-to-turn pages. Like other reGreet materials, the card organizer uses a minimum 30% post-consumer waste with soy ink. reGreet donates a portion of their profits to groups like 4-H, The Nature Conservancy and Susan G. Komen for the Cure®. Disclosure: I received a free reGreet kit and card organizer from reGreet. For more info, view my privacy + disclosures page.